Ever since the first synthesizer bass lines appeared in the 1970s, bass players have been searching for a way to emulate them without having to learn to play keyboard. The first attempts to do so involved wah pedals and envelope filters. Eventually, effects manufacturers began producing bass synth pedals that offered envelope and waveform controls that advanced the quest a bit further. Roland and other manufacturers such as 360 Systems in the 1980s pioneered a true bass synthesizer that would work with nay bass guitar via a special pickup, but the units still had trouble producing something that tracked well and didn't cost more than the bass itself. With the debut of its Super Synth effects pedal for bass, Italian manufacturer Markbass may have struck a blow for bassists everywhere by producing as pedal that tracks well, has a variety of instantly usable sounds t5hat can be tweaked via software and yet costs less than $300. 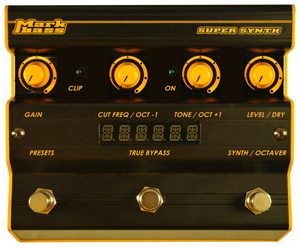 Like MarkBass amplifiers, the Super Synth sports a black- and-yellow color scheme and crams eight presets into a small package with only four control knobs, a digital readout and three footswitches for scrolling through presets, octaver/synth selection and bypass. The Super Synth also doubles as a digital octaver, offering octave up or octave down layers. The parameters of the pedal’s factory presets can be modified using the Markbass Pedal Controller software with any computer. Simply install the software, connect the pedal to your computer using a USB cable, modify the presets as desired, and then load them back onto the pedal. Buzz out of Winter NAMM 2010 made on the Super Synth one of the most highly discussed and anticipated new pedals on the Internet. Finding one to try out locally is nearly impossible, and initial shipments flew out the virtual doors of online retailers. At this writing,there is a six-week backorder on the Super Synth. However, based on the comments of the few lucky players able to snag one of the initial shipment and on a demo video on the Markbass website (www.markbass.it), I believe the Super Synth will soon find a home on the pedalboards of many bassists. The Markbass Super Synth has a street price of about $270 USD. Visit www.markbass.it for more information, a sound sample video and a downloadable owner's manual. Compiled from information on the Markbass website.